The task of replacing or adding to your staff, in a timely manner, is one with the most serious of consequences. After all, hiring the wrong people takes a toll on your company – and your reputation. The economy is picking up and many professional sectors are adding jobs and showing signs of recovery from the recession. While this is great news for businesses and professionals alike, companies now find themselves faced with a new phase in the war for talent. What defines each generation? When did they enter the workforce? What are each generation’s strengths? What makes them tick? How do you effectively manage a team with a wide range of professionals? There’s no one-size-fits-all guide for managing a modern workforce. There are too many different types of workers from different generations. They must complement each other and work together to thrive. Ajilon has helped us accomplish that in so many ways. 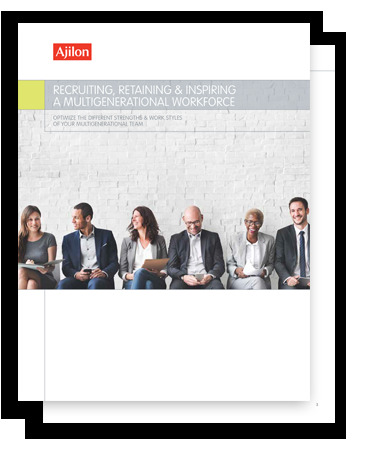 Fill out the form to get your copy of "Recruiting, Retaining & Inspiring a Multigenerational Workforce."